Downstairs making lunches for my children in the early morning hours, it was already apparent that there was something special about this day. The hard boiled eggs easily shed their skins. The peanut butter had a lovely oily sheen. I had enough vanilla yogurts to go around. Making lunches was never this enjoyable. Even waking my kids and watching them drudge themselves from their slumber took on a rose colored hue. They looked young and gorgeous. Even I didn’t look half bad as I gazed at my reflection in the bathroom mirror. Okay, the lights were off, but whatever. Maybe it’s because today is my birthday. I am 43. Wow, that sounds old. 43 is a woman with short hair and 10 extra pounds in mom jeans, not me. Although, I can’t say the gym clothes I’m sporting on a daily basis will be seen in Vogue anytime soon. And I have recently gained a few pounds. Crap. Well, I certainly don’t feel 43. I mean, sometimes I feel 100, but certainly not 43. On most days, I think I settle in nicely around 31, although for the record, 27 is the age to be… not so young as to still be in some back alley throwing up your fourth margarita and accompanying nachos on your borrowed overpriced shoes, but not so mature that you limit the potential of your own possibility. But 43… Wow, again. I seem to be stuck now obsessing over the number. I can’t move on. I can’t look away. I need to get it out of my head. 43434343434343434343434343. That’s better, for some reason now all I see is 34. I’ll take it. Something about birthdays make you feel very young and hopeful, like there’s a surprise waiting for you around every corner. They also can make you feel very old, like when you realize, there are no surprises anymore, only kids who couldn’t bother to even make you a card and a husband who didn’t take the early train home, and spent the night watching the Yankees. This year, I’m taking control of my birthday and not leaving it in the hands of amateurs. I’ve scheduled my annual physical this morning. I thought it was a positive way to start the year. After that, I’m heading straight to the gym. Then I’ve got a massage appointment, followed by lunch with friends. I love it already. My husband walks in the kitchen where I’m finished with the lunches and have started giving the boys breakfast. “Happy birthday, Mommy!” he booms. “Did everyone say happy birthday?” Three sleepy heads lift. A muted chorus of unenthusiastic “Happy birthday, Mommy” dutifully follows. “That’s it?” My husband bellows. “That’s all Mommy gets?” That woke them. Immediately, three bodies attack me with hugs viscous enough to suffocate a small animal. I beam. That’s more like it. I’m totally feeling the glow, all warm and happy. I add pick up ice cream cake to today’s to-do list. Maybe they will, maybe they won’t, but I’m old enough to know not to put my happiness in anyone’s hands besides my own. It’s a gift. Posted in Crap that makes me eat too much ice cream, Every Day Scoops and tagged Birthdays, happy birthday, middle-age, Yeah write. Bookmark the permalink. Happy Birthday!!! Going to be so much better that last year! Love it and the post. Woohoo!!! Happy birthday! I’ll be sure to use your tactic and switch the numbers for my upcoming 43rd birthday this year. We should create a scale that always tells you the weight you dream of! We’d sell millions. Happy,happy happy birthday my dear! …”not to put my happiness in anyone’s hands besides my own”….this long sentence is the most valuable in your post and something you should never forget……. So much to celebrate!! 100 posts– Whoop! A fun birthday plan! And looking not one day over 25! are you sure you’re wearing your glasses??? ha!! i’ll take that.. thank you! Happy, happy birthday! On my 30th b-day in January I picked up my own ice cream cake too. I knew my husband or my sister might do it for me, but I wanted that cake really badly and I wanted it to be the flavor I wanted, so I did it myself, and it was glorious. I’m 43, too! I definitely have the ten pounds – or 20. But not quite the short hair. Happy day to you! Happy year! Way to not leave it in the hands of amateurs. 🙂 Love this and sort of hate and struggle to find the joy in birthdays every year. I think your hands-on management sounds like the plan. That’s the spirit! You are amazing and inspiring at any age, but especially at this one. :) Happy, happy birthday! Happy birthday! And you don’t look a day over 27! Happy Birthday! Just remember that you’re in your prime, okay, in a prime at least, as in prime number. This is why Kellie is always calling me a dork. haha!! i’ll take it! Thanks. OMG, your math would make me 64!! I may never recover from the shock! 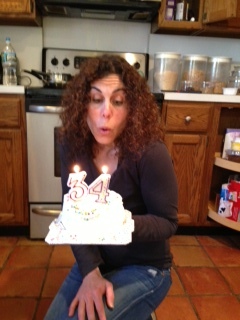 A little birthday dyslexia with the candles never hurts either! Happy Birthday! and congrats on the 100th…I look for your posts ever since I joined! Happy Birthday! You are a young’un compared to me! Happy Birthday! Love this- “I’m old enough to know not to put my happiness in anyone’s hands besides my own.” I am still trying to own this one- although now at least I realize it! it’s not easy. i’m getting better at it, now that i’m old!! Happy Birthday. I’m wishing you much Haagen Dazs. your wish has come true!! yum!! thank you! Fantastic!! Happy birthday mama!!!! You have so much to celebrate!!! Happy birthday! I really enjoyed this post. You seem so relaxed and carefree and comfortable with your life. That in itself is such a blessing. Then to get tackled by three boys in the morning and, hopefully, the man tonight is just icing on the cake. Have a great one, Alisa. exactly. and it’s been a good day!! Happy birthday! Remember what they say, life begins at FORTY! Cheers to your birthday AND 100th post! I enjoy your humor and writing! So happy you shared your birthday with us! Happy Birthday to youuuuuuu! Happy birthday! 43 is my favorite number! Happy birthday! I love that last part about not waiting to see who will and won’t do anything. Great way to look at things! two cakes!!! i bought one myself and then got another one!! haha! Happy belated Birthday! Loved this post and your attitude. Thoroughly enjoyed this, especially considering I’ll be 43 on my next birthday. Hope you have a happy day!! thanks! and it’s 34! haha! No f-ing way! My birthday was yesterday!! April 23? or is yours April 22? Either way, happy, happy birthday sister!! I hope your day was wonderful. You must be doing something right – 100 posts and looking good! APRIL 23rd???? NO WAY! did you have a fabulous birthday??? Yes, April 23!!! So weird and wonderful! I’m honored to share a birthday with you! I had such a great day – I’m definitely blessed. How about you?!! i cant believe it!! i had a wonderful day, thank you. so glad you did as well!! i’m still a little shocked – i mean, my first real and most special connection as a blogger… we already had so much in common! this might be too much! haha! Happy Birthday! I thought it was interesting that you had scheduled your check-up on the same day as your birthday. A couple months back, I had my 45th birthday on the same day as my physical as well. I considered it a gift, that my Dr. decided to forego donning the rubber glove and not give me my over 40 exam. Happy, happy, happy birthday! I hope the rest of your day was just as awesome! Cheers! Happy birthday, and thanks for sharing it with us!